This recipe is adapted from the Ball® Complete Book of Home Preservation. I love this book! I have been canning a lot lately - rather obsessively, actually - and it has been a pleasure to work my way through its pages. This time of year is always marked by a bevy of stone fruit, and this recipe is a great way to preserve some of it for for another season. I like this recipe a lot because it has all the yumminess of salsa without tomatoes. As a tomato-avoiding person, I was darn excited to see this. I have made the recipe twice, and each time it has turned out great. The first time I prepared it as written in the book, and the second time I prepared it with a few tweaks of my own and doubled the recipe. I have a lot of peach salsa in my canning cupboard right now, it's kind of ridiculous. I know it is delicious because one of my jars was a dud and it didn't seal properly, so I had to eat it up. And boy, is it good! Whether you avoid tomatoes or not, I think you'll love it. The salsa is also very good fresh, so feel free to reserve some to eat right away and can the rest. This recipe makes a big batch - I tend to think that if you're going to the trouble of canning, you might as well make enough to have extra jars to give away to friends (or to hoard for yourself to enjoy during the cold winter months). But if you prefer, feel free to halve the recipe for a smaller batch. Prepare canner, jars, and lids. Prepare boiling water canner by filling with enough water to cover jars by 1-2 inches. Place over high heat and bring to a boil. Wash jars and lids with hot, soapy water, and place in a bowl of hot water (NOT boiling) until you are ready to fill them. I often like to fill a teapot with water and bring to a boil, just in case I find I need more water for my canner once I fill with jars. Prepare ingredients as directed in ingredients list above. In a large, tall stainless steel pot, combine vinegar and peaches. (TIP: To keep peaches from browning, add them to the pan as you chop and measure.) Add onion, jalapeño, bell pepper, honey, garlic, coriander, and toasted cumin seeds. Bring to a boil over medium-high heat, stirring constantly. 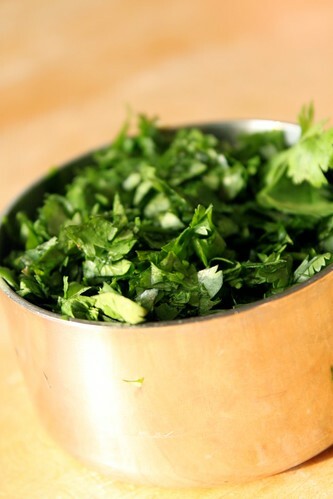 Add cilantro and reduce heat and boil gently, stirring frequently, until slightly thickened, above 5 minutes. Remove from heat. Ladle hot salsa into hot jars, leaving 1/2 inch headspace. 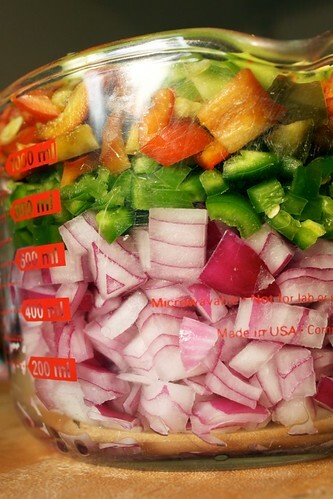 Remove air bubbles and adjust headspace, if necessary, by adding more hot salsa. Wipe rims clean with a damp, clean cloth. Center lid on jar, then screw band down until resistance is met then increase to fingertip-tight. Lower jars into boiling water canner, making sure that jars are covered by 1-2 inches of water. Add more boiling water as necessary, and cover with lid. Once water has returning to a rolling boil, start timing and process 15 minutes for elevations up to 1,000 feet above sea level (increase 5 minutes for every additional 1,000 feet of elevation). In Minneapolis, I process for 15 minutes - our elevation is approximately 850 feet above sea level. Once time is up, shut off heat, let sit in canner for 5 minutes, and transfer jars to a double thickness of towel placed 1-inch apart. Do not tip jars or wipe dry - water will evaporate. Let sit undisturbed for 12-24 hours, away from drafts. Then check seals - the tops of the jars should dip in the middle, and not bounce back when you press down with your fingers. If jars are well-sealed, wipe them clean, label, and store in a cool, dark place. Consume with in 1 year. Jars that did not seal should be refrigerated and contents consumed. Eat within a week or so. 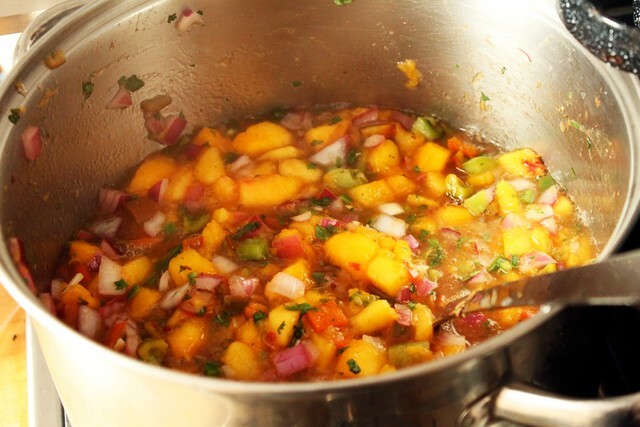 ** Choose slightly firm peaches so your salsa isn't too mushy. To peel, wash the peaches well and lightly slash an "x" in the bottom of the peach. 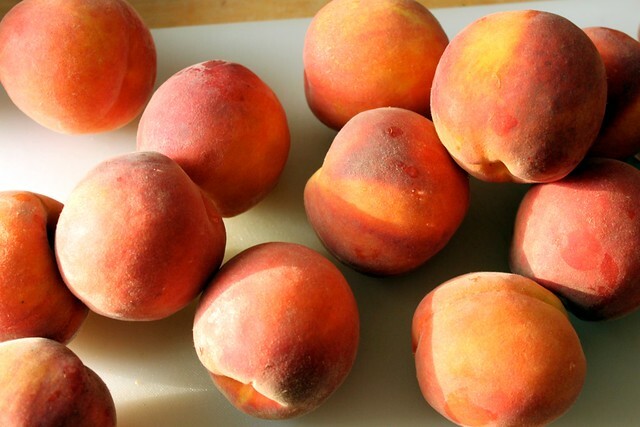 Bring a pot of water to a boil and add peaches, then boil for 1 minute. Remove from pot and place peaches in a bowl of very cold ice water. After a minute or two, remove peach from bowl of ice water and slip off the skin. And thus, your peach is peeled!